The Hercules Prophetview 720 is a high quality 15-inch LCD monitor featuring a large display area, similar to a 17" tube monitor. It is compatible with all VGA graphics boards and functions at a recommended resolution of 1024 x 768 pixels for games and multiple window applications. The monitor's enhanced high contrast and brightness settings provide you with optimal visual comfort. With it's slender ultra flat design, futuristic boomerang base, and fashionable blue color, the Prophetview 720 is a stylish work of art. Furthermore, Hercules' Prophetview 720 takes up less desk-space than other monitors, features ultra-low power consumption, is lightweight and complies with the highest safety regulations. Prophetview 720, the new standard in ultra-flat screens, is the perfect LCD monitor for both home and business use. 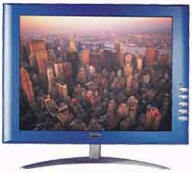 The Hercules LCD 15" Prophetview was launched at E3 which took place between 17th - 19th of May, 2001. Following the tragic events that took place in the USA on September 11th, the photo of Manhattan on the product packaging was changed as soon as it was technically possible to do so, i.e. in time for delivery of the next batch.